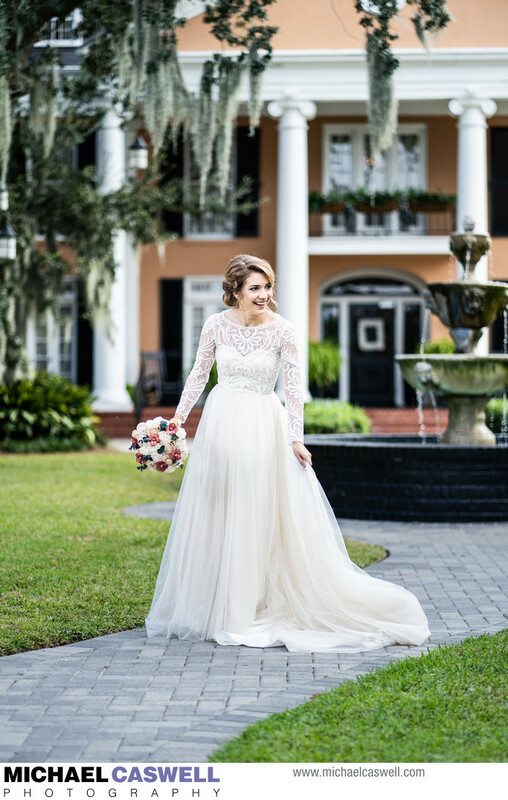 While Southern Oaks Plantation has earned a well-deserved reputation as a top-notch wedding venue in the New Orleans area, this location can also be used for Southern Oaks brides on weekdays for their bridal portrait session. For brides looking for a nice outdoor setting, often this means City Park or Audubon Park, which are both fine options, but a portrait session at Southern Oaks can provide amenities like space to change in and out your wedding dress, as well as a significantly greater degree of privacy. The brick-paved walkway with the fountain, plantation, and the grand moss-covered oak tree in the background is an iconic Southern Oaks shot. The swing hanging from this tree is another favorite among Southern Oaks brides, and it's also a very popular spot for portraits of the newly married couple on the wedding day. A variety of dramatic and beautiful bridal portrait images can also be captured indoors on the spiral staircase, and the venue's gorgeous lounge room is another good spot. This particular session took place on a lovely afternoon in October. The free-spirited bride didn't feel that the traditional type of bridal portrait posing suited her personality all that much, so even though we did capture some of those types of images, we also mixed in some more loosely posed, candid-like shots like this one. As much as I'd love take credit for the lovely and natural expression on her face, this was solely the result of her reacting to the posing instructions her mother was calling out from off to the side.